German jurist; born at Bayreuth, Bavaria, Oct. 2, 1851. He received his education at the gymnasium of his native town and at the University of Munich, whence he was graduated as doctor of law. After being admitted to the bar he became, in 1878, privat-docent of the juridical faculty of his alma mater. In the following year he was appointed judge ("Amtsrichter") of one of the district courts in Munich, and in 1885 second attorney ("zweiter Staatsanwalt") of the Munich circuit court, where in 1890 he became one of the senior judges ("Landgerichtsrath"). In 1896 he was made honorary professor at Munich University. In 1897 he was transferred to the court of appeals at Munich as attorney ("Staatsanwalt"), and in 1899 was appointed one of the senior judges ("Oberlandgerichtsrath") at this court. Harburger is one of the few jurists of Germany who are at the same time judges and university professors. 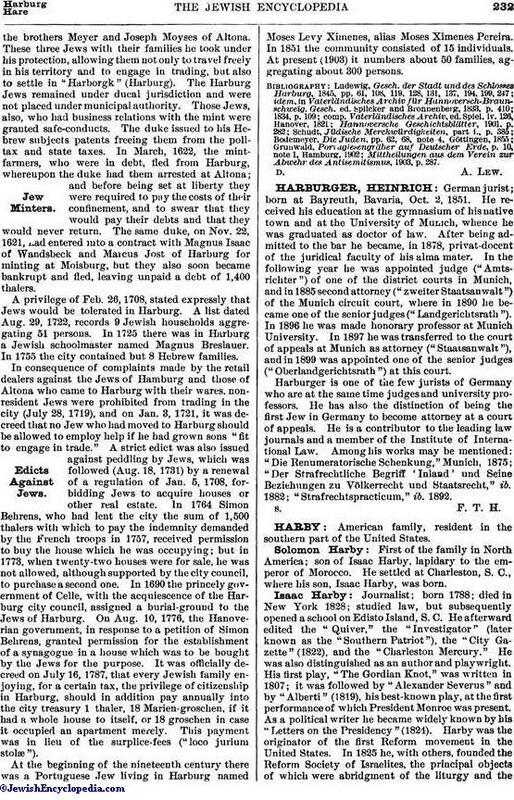 He has also the distinction of being the first Jew in Germany to become attorney at a court of appeals. He is a contributor to the leading law journals and a member of the Institute of International Law. Among his works may be mentioned: "Die Renumeratorische Schenkung," Munich, 1875; "Der Strafrechtliche Begriff 'Inland' und Seine Beziehungen zu Völkerrecht und Staatsrecht," ib. 1882; "Strafrechtspracticum," ib. 1892.